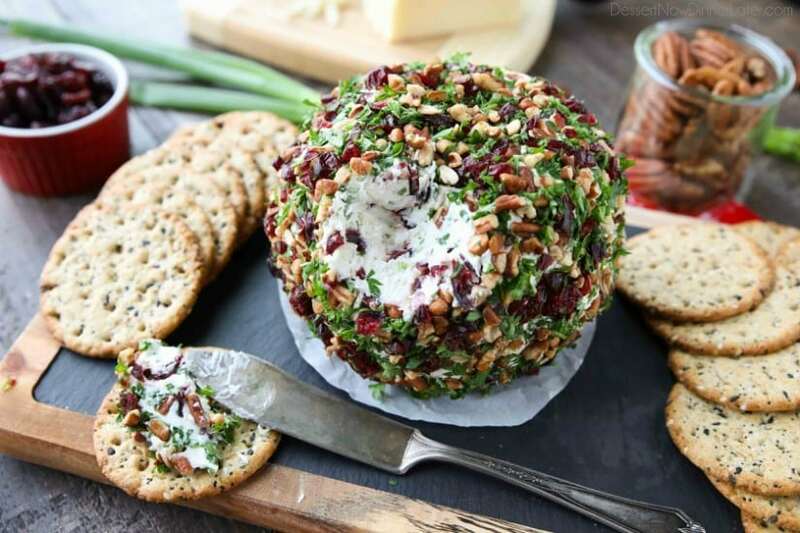 Cranberry Pecan Cheese Ball - Dessert Now, Dinner Later! 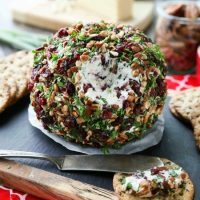 This Cranberry Pecan Cheese Ball is a festive appetizer for Thanksgiving, Christmas, or New Year’s Eve! So easy to make, and tastes great! 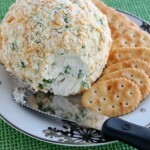 One of the best, and easiest, holiday appetizers I can think of is a cheese ball. Everybody loves a cheese ball and crackers! 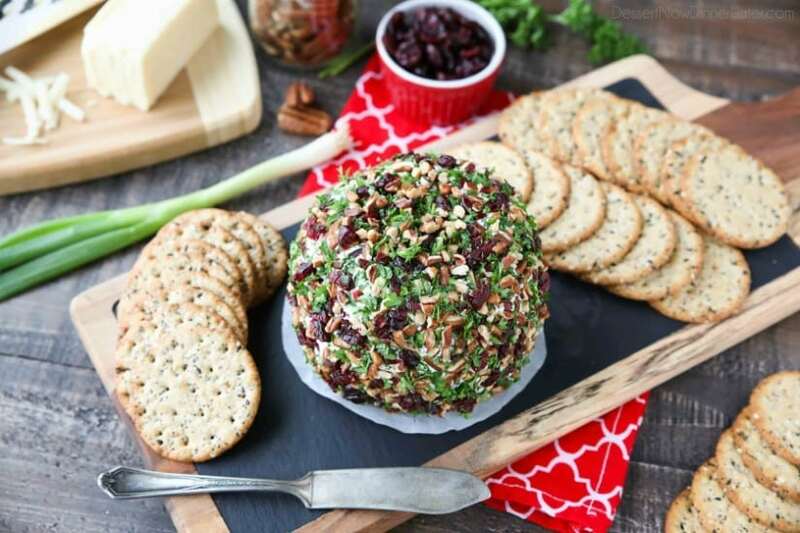 This Cranberry Pecan Cheese Ball has a good mix of sweet and savory notes and couldn’t be easier to make. 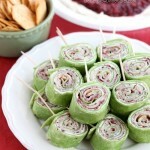 Cream cheese, green onions, dried cranberries, and sharp white cheddar cheese are all rolled up into one tasty appetizer. 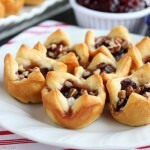 The outside is decorated with pecans, parsley, and more dried cranberries. It gives it a gorgeous and festive presentation. I brought this to a “Friends-giving” dinner and had several ladies comment on how beautiful and delicious it was. 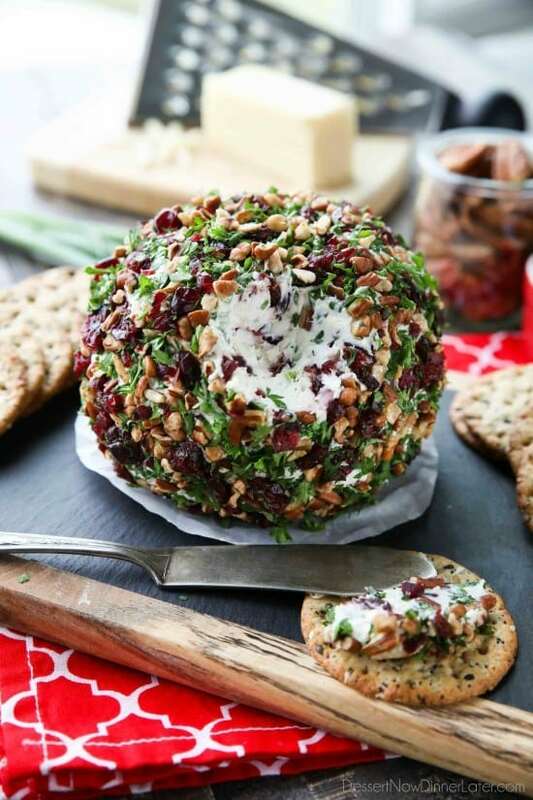 You can literally whip up this cranberry pecan cheese ball in about 10 minutes and take it with you to your holiday party. Or you can make it ahead of time. The flavors will marry even better the next day. My family will pretty much snack on a cheese ball and crackers all day long until the big holiday meal is ready. And we always have a cheese ball on New Year’s Eve. It’s a staple for us! I hope you love this recipe as much as we did. My son is already asking me to make it again! Using an electric mixer with the paddle attachment, beat the cream cheese with the dried cranberries and green onions. Add the shredded white cheddar cheese and mix until incorporated. Scrape mixture out onto a large piece of plastic wrap. Use the plastic wrap to shape the cream cheese mixture into a ball. Combine coating ingredients onto a large plate. Roll the ball into the coating ingredients until covered completely. Serve immediately with crackers or refrigerate several hours to overnight for more flavor. Store in the refrigerator. 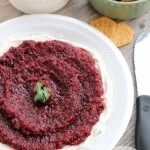 - Chopping the cranberries distributes them better and releases more flavor in the cheese ball. I highly recommend. 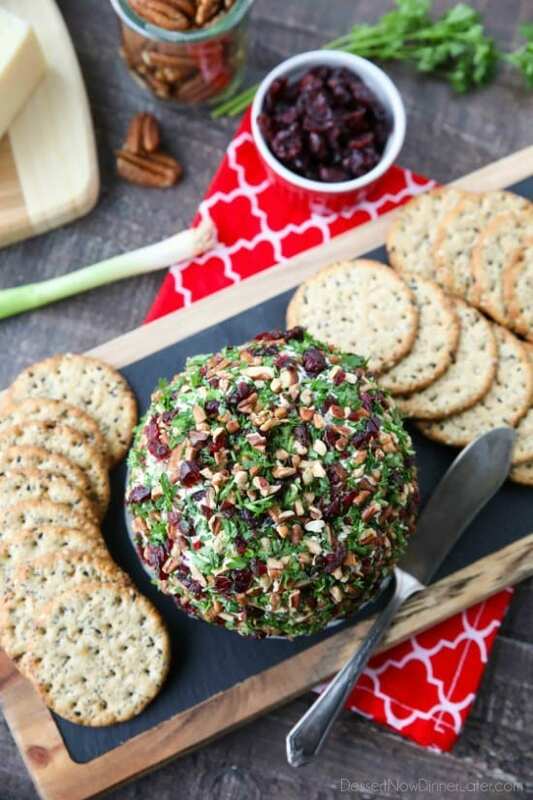 I am in love with this Cranberry Pecan Cheese Ball recipe. I will definitely try this very soon. Thanks for sharing this awesome recipe. Made this for Thanksgiving. Very good. Thanks! Hi Janet! I’m so glad! Thanks for coming back to let me know how it went! Amber! Everybody LOVED IT!! I can’t believe how huge that thing was when it was all done! 😉 super tasty and even Brian said that he was surprised how tasty it was and he’s usually not a fan of cranberries! My MIL also said that she liked it b/c it wasn’t spicy (she has overactive taste buds). Definitely a win/win recipe that I’ll be adding for our holiday collection!! Thanks again! Yeah it makes a lot! Haha. Glad it was a hit!